Russian cuisine for the masses. 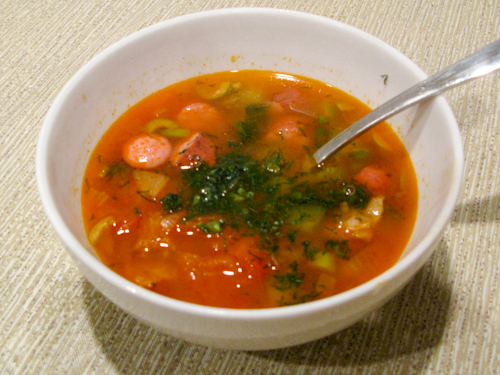 For a first update in a while I have decided to add a recipe for another very popular Russian (Ukrainian in origin) soup. This is another recipe with many different variations and in modifying it is actually encouraged. This particular recipe we pulled out of an old Russian recipe book and it produced some excellent results. There are other variations of Solynka made with either fish or mushrooms. 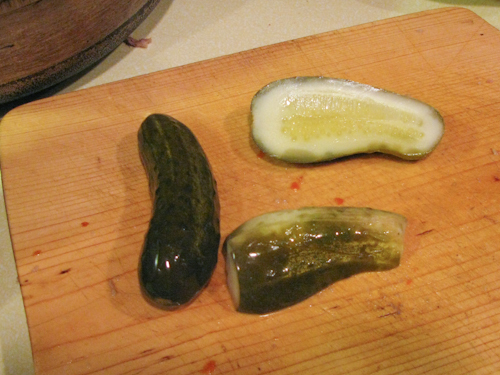 The word Solyanka refers to the salty/sour taste of the soup, which comes from the pickles and sauerkraut commonly used to prepare it. Alternatively you can start off with store bought beef broth and dress it up with some vegetables. 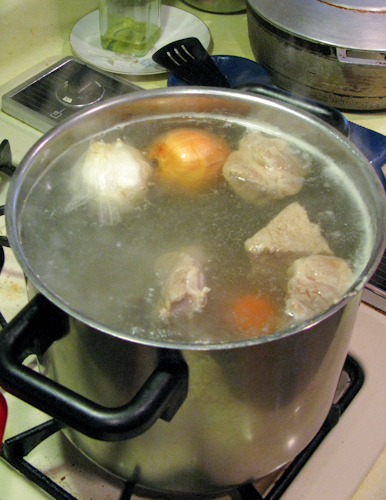 We started with the broth preparation. 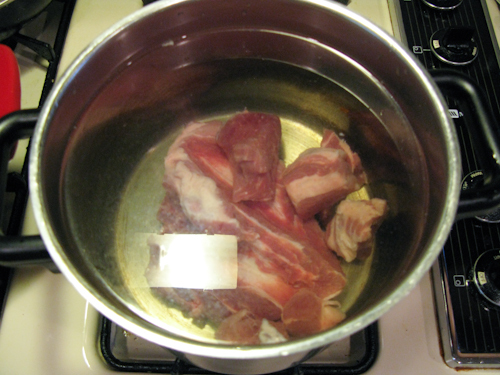 In a large pot of water, drop your meat set aside for the broth. 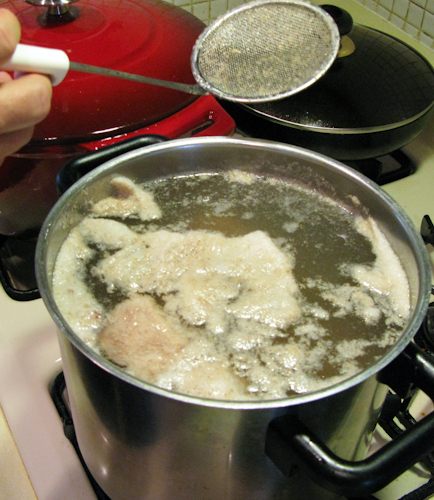 Bring to a boil and skim all the foam that forms on top during this process. Otherwise you’ll end up with unpleasant chunks of protein at the end. Drop in the broth vegetables and cook at a simmer for at least an hour. Strain the broth of the vegetables and discard. Remove and discard any bones. 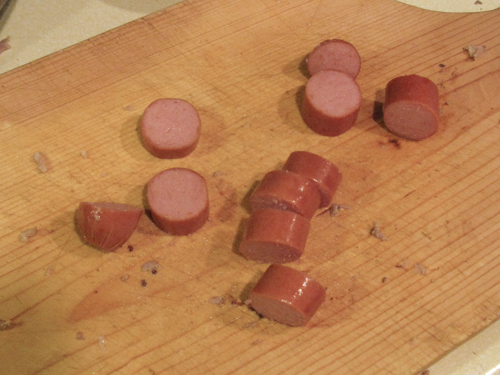 Remove the meat, cut it up and throw right back in. 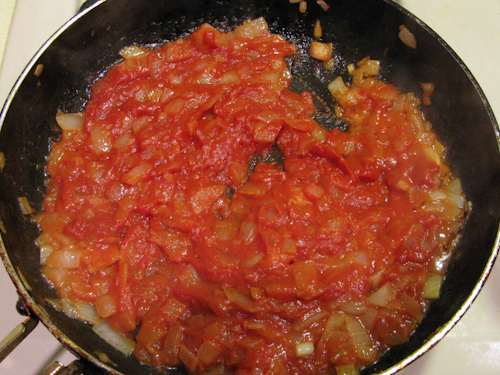 In a pan, brown the chopped onions and add the tomato paste. Combine and cook for a few minutes. 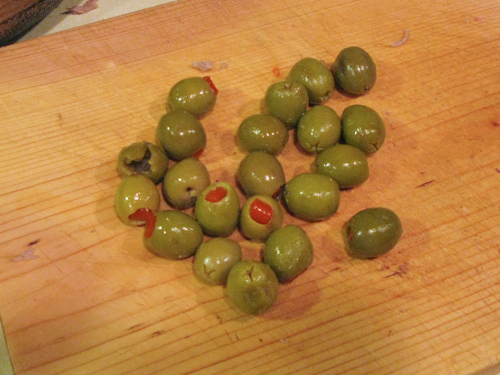 Add the olives, pickles, and tomatoes. 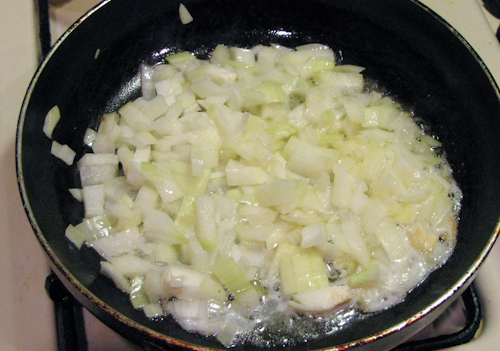 Season, and cook for an additional 15-20 minutes at a simmer. 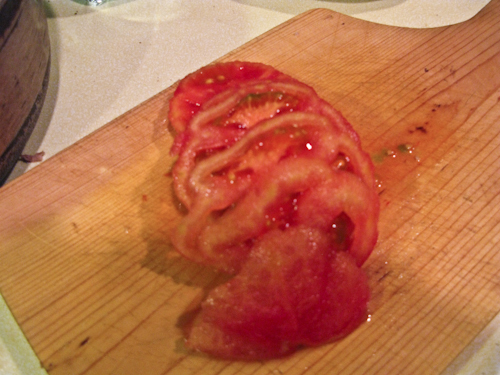 Serve warm garnished with chopped dill and/or a table spoon of sour cream. Posted in: appetizer, Meat Dishes, Pork, Soup. 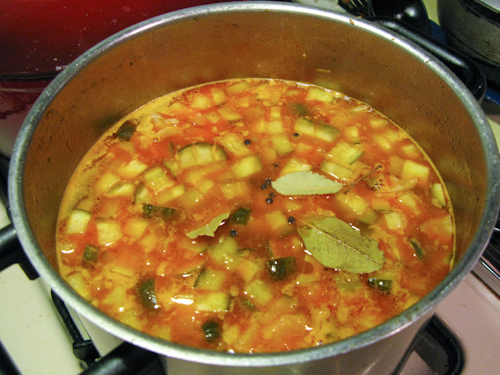 Solyanka is one of my favorite soups. When we are in St Petersburg center we often stop at Laima’s to partake of their variety. I’m going to show this entry to my wife, an excellent Russian home cook! I think your photos we’ll inspire her to put her spin on this item. I occasionally do a post on food, and the next one will be about sharlotka, and include a list of 10 Recommended Russian cooking blogs, including Everyday Russian Food. Please stop by and see if I need to add any others you may know about. Where are you from in Russia, and what do you like to be called? the soup is easy to do and the taste must be great. I will ask my mother to do it and take it to school and show it to the teacher. Your recipe was great and I will be waiting for more recipes as good as this one. How could I contact you by mail? That’s about a possible cooperation. you can reach me at everydayrussiansite AT gmail DOT com. Yum, I’m glad found this. I’m gonna make some. I had a stint working in Moscow a while ago. My russian colleagues and I would have Solyanka for lunch in the company cafeteria. Brings back memories. Bravo! 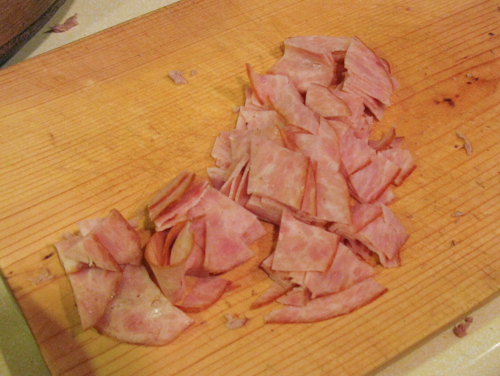 This is the best mixed meats solyanka recipe, and I love the pictures. Great color of the final product. 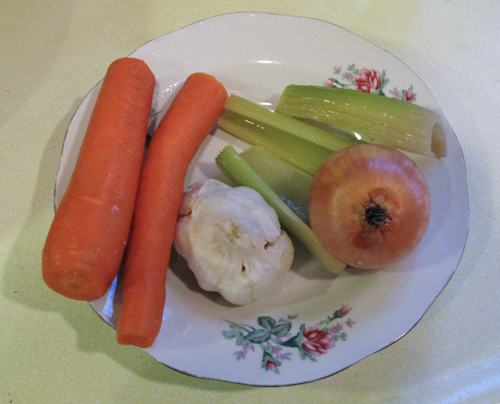 Your broth preparation is classic, just like my mom’s, with a powerful addition of celery. – add a couple of slices of lemon when serving! All my solyanka junkie friends do that. Classic Russian Cooking: Elena Molokhovets' "A Gift to Young Housewives"